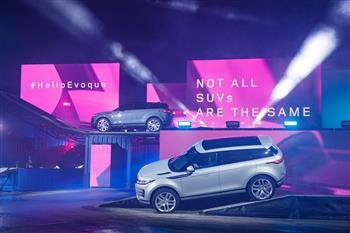 London, UK, 22 November 2018 – Land Rover's highly-anticipated luxury compact SUV, the New Range Rover Evoque, has been revealed in London's creative East End with a high-energy display which saw a number of vehicles driving across digital skylines around the globe. Gerry McGovern, Land Rover Chief Design Officer, said: "When Range Rover Evoque made its debut back in 2010, it transformed the world of compact SUVs and the new model is set to continue that remarkable journey. This characterful vehicle combines refinement and fun to create that all important emotional reaction that will turn heads and make people smile." Having pioneered the luxury compact SUV market, with global sales of over 772,096 and more than 217 international awards, the new Range Rover Evoque is a sophisticated evolution of the original. Combining unrivalled Range Rover heritage with cutting-edge technology – designed, engineered and manufactured in Britain – it meets the needs of today's customers. Tech firsts include 'see through bonnet' technology and a rear-view mirror that turns into an HD screen displaying a camera feed of what's behind the vehicle. Nick Rogers, Executive Director, Product Engineering, Jaguar Land Rover, said: "Underneath the skin is an engineering and technical revolution. The architecture is all-new to accommodate both plug-in and mild hybrid systems, with only the door hinges remaining unchanged on the body. The new chassis makes the most of the stiffer body, ensuring the characteristic ride comfort and refinement of a Range Rover. "Evoque is now smarter than ever. The software that sits behind our infotainment system has been refined to provide a more intuitive customer experience. On top of that, we've added Apple CarPlay and Android Auto for seamless smartphone integration." Land Rover also collaborated with a number of fashion and technology brands to bring the design, innovation and sustainability characteristics of the New Range Rover Evoque to life. The latest Zenith watch from the DEFY Classic collection was specially co-developed by design and technical engineering teams working in close harmony. The 200-piece limited edition is a combination of unmistakable elements drawn from its automotive inspiration, from the colour to the design itself. The Range Rover Evoque Zenith watch is available to buy now through Zenith's retail network or limited Land Rover dealerships from early 2019. Since 1948 Land Rover has been manufacturing authentic 4x4s that represent true 'breadth of capability' across the model range. Defender, Discovery, Discovery Sport, Range Rover, Range Rover Sport, Range Rover Velar and Range Rover Evoque each define the world's SUV sectors, with 80 per cent of this model range exported to over 100 countries. Land Rover's highly-anticipated luxury compact SUV, the New Range Rover Evoque, has been revealed in London's creative East End with a high-energy display which saw a number of vehicles driving across digital skylines around the globe.